My little bully babies are growing up. 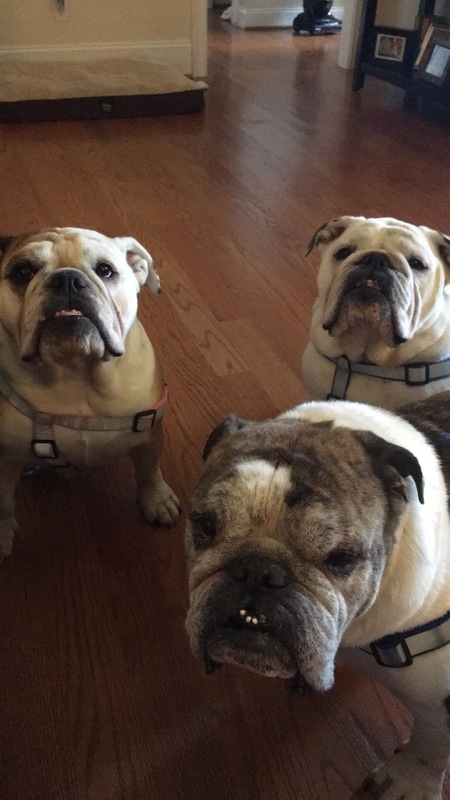 Sarge & Stella turned 6 at the beginning of July and T-Bone turned 8 at the end of July. We celebrated Sarge & Stella's birthday at home with some special treats from the local pet store. T-Bone got to be at his favorite place on his birthday (our cabin in WV). Unfortunately I was a bad dog mom and forgot his birthday hat and treat, but he got extra loving and sang to multiple times. T-Bone had his bi-annual check up just before his birthday and had a good report. We are changing his eyedrops due to the formula change in what he was using - it was making his eyes red and itchy. And then, in his ear (not the one that just had surgery) we noticed a tick like thing in one of the folds. He got very irritated with us when we messed with it, so thankfully his appointment was the next day, so I figured I'd let them piss him off. Turns out, its not a tick. The vet said it looked just like the mass that he saw in his other ear canal 😱. So, we are going to keep an eye on it. Thankfully, its in a good spot that our vet can cut it off rather than having to go back to UGA. Yay! And, we added some glucosamine to his supplements (Sarge & Stella have started getting it too). I probably should have already been doing that since he's old, a bulldog and has had knee surgery. Again, bad dog mom 😔. Nothing else to report. They are happy, healthy and loving life being spoiled rotten (as all pets should be). T basking in the sun at the cabin. Sound asleep on the drive home from camp. Happy birthday to all your fur kids!